Moving To Or Living In Stone Mountain, GA? We Got You Covered! As one of the premier property management companies in Stone Mountain, we wanted to make your move to Stone Mountain Ga a little easier. So we went about gathering information that we think you might find useful, such as schools, parks, utility companies, etc. Places to see and things to do from the best source ever, TripAdvisor. There are a lot of things to do in the City of Stone Mountain and of course anyone familiar with Atlanta and its surroundings knows about the Stone Mountain Park. However, not many people know about the town of Stone Mountain and how it came about. 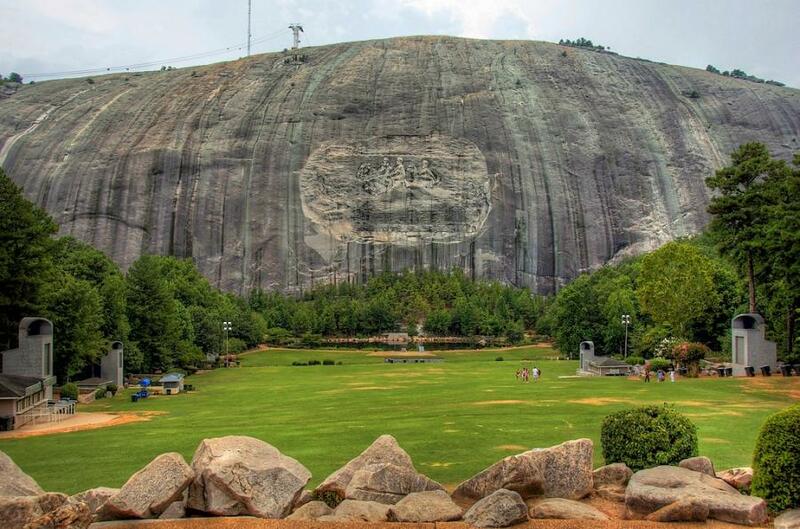 The town is named for Stone Mountain because of the largest exposed granite dome in North America. It is also the site of a famous giant carving commemorating the military leaders of the Confederacy as well as a state park and museum, including a steam railroad. The historic train depot is home to the former City Hall and the Police Department. The South wing of the depot was constructed in 1856. The north wing was constructed in 1914. It is the oldest structure that was burned by General Sherman during the Civil War that is still in use today. In 1822 the area that now makes up the City of Stone Mountain was made a part of the newly formed DeKalb County. A post office was created in 1834 on the old Augusta Road, and Andrew Johnson built a hotel along the road in 1836. At around the same time, Aaron Cloud built an observation tower at the summit of the mountain. Visitors to the mountain would travel to the area by rail and road, and then walk up the 1.1 mile mountaintop trail to the top, where Cloud also had a restaurant and club. By 1839 a general store was added and a village was established under the name New Gibraltar. The name was officially changed to Stone Mountain by the Georgia legislature in 1847. ALH|Podland Realty LLC has been providing professional Stone Mountain property management services since 2008, is a member of the National Association of Residential Property Managers (NARPM). First as investors ourselves, then, as a property management company. We treat each home as if it was one of ours and each investor as if they are one of us. Why? Because we are property owners ourselves and our property managers provide a true "For Investors, By Investors" Stone Mountain Property Management Service. Your rental property is marketed to over 50 search engines such as Zillow and Zillow Premium, Trulia, Hotpads, Realtor, Homes, Free Rental Site and many, many more. As your Stone Mountain property management company, we offer a six month guarantee on our tenant placement services. ALH|Podland Realty has spent last eight years perfecting its systems and processes and improving the way Stone Mountain property management services are done, so you can trust ALH|Podland Realty professional property managers to give you professional, timely, courteous and accurate property management service. Our responsive team of highly-trained property managers are prepared to meet the extensive demands of Stone Mountain property management – 24 hours a day, 7 days a week, 365 days a year. Our licensed builder oversees all maintenance issues and has a crew of professionals to resolve any issue that comes up. From evictions and troublesome tenants, to marketing and understanding legal issues, we know what works, what rents, and how to get more from your property-with less disruptions for you. We have the experience, licensing and insurance to save you money, help you make money and avoid costly mistakes. Stone Mountain property management can be a difficult business, which is why more investors are leaving their properties in the hands of professional property management companies. Whether you own one rental home or a large portfolio of investment properties, ALH|Podland Realty has the expertise you can count on and trust.